Raksha Bandhan is a significant Indian festival that enhances the love between the siblings. 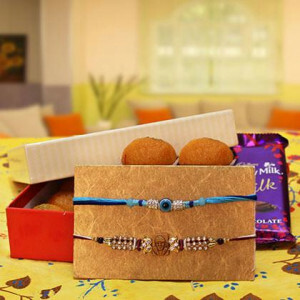 Gift these charming rakhi to your dearly loved brother along with half kg Motichoor Laddoo and a Dairy milk chocolate to make the occasion more special. Give a traditional touch to your rakhi gifting by sending this stunning combo that contains an attractive Rakhi, 16pc Ferrero Rocher, 100 gm Cashew and Greeting card to express your feelings. 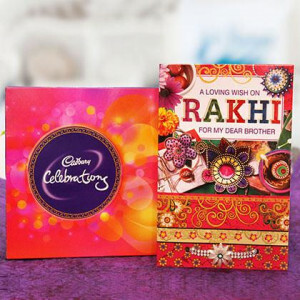 Make stronger your bond of love with your darling brother by sending these appetizing 121.3gm Cadbury Celebration and make the occasion extra sweet with a Rakhi and special Greeting Card for your beloved brother. This rakhi combo is the gift of something chocolaty to pleasure and marvelously crafted Rakhi makes the ideal Rakhi surprise. 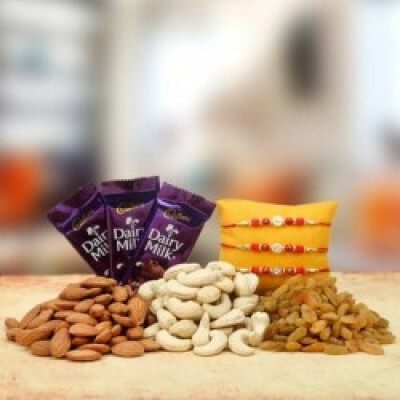 So make choice for this ultimate Rakhi gift combo that is inclusive of Rakhi with 10 Dairy milk in a Basket. If your little brother has fond for chocolates, he will love this effortless, yet, ideal Raksha Bandhan Gift combo. 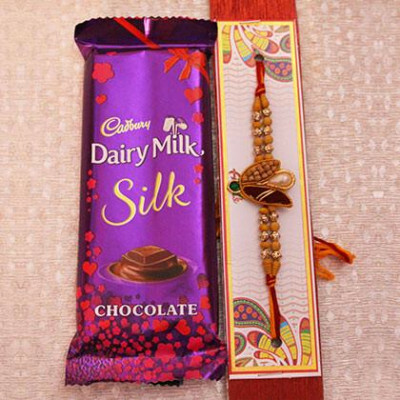 The combo includes a stunning Rakhi with 5 Dairymilk of 12.5gm. 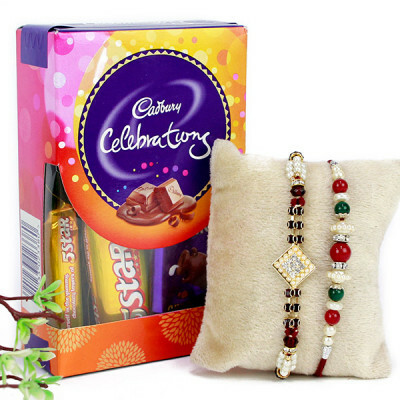 On this delightfully pleased occasion of Raksha Bandhan, this luscious rakhi combo that contains a stunning and attractive Rakhi with 4 Cadbury Temptations is specially organized for your beloved brother. Raksha Bandhan is a significant festival that is celebrating the spirit of the unique bond shared between a brother and a sister. 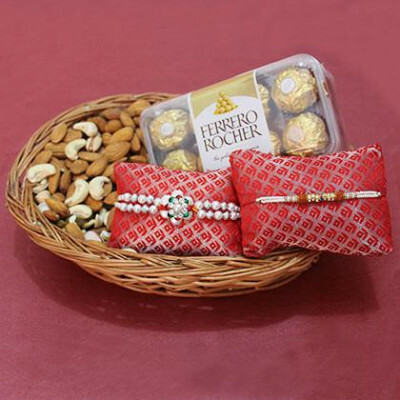 Gift this delightful rakhi along with 2 Snickers Chocolates to your darling brother. 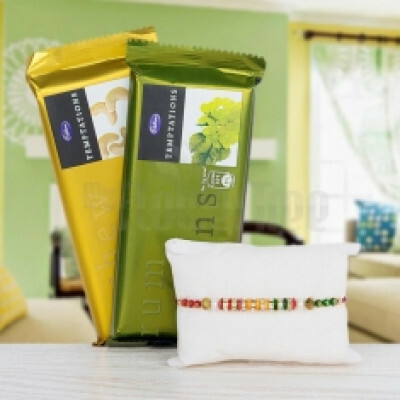 Rejoice this Raksha Bandhan with some contemporary sweets. Astonish your Brother with a gorgeous Rakhi and some appetizing Chocolates- 1 Dairymilk Silk, 1 Bournville, 1 Temptation Chocolate and Greeting Card. Raksha Bandhan is faultless when it contains a lot of goodies. This Gift Hamper is an ideal gift to show your love for your brother as it has a special and attractive Rakhi, 1 DairyMilk Silk Chocolate. 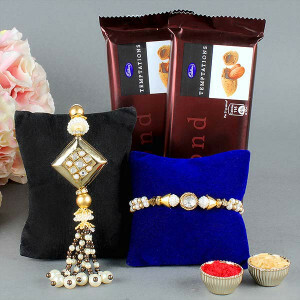 For the loving brothers who love chocolates, this simple, yet, wonderful Raksha Bandhan Gift Hamper is the best choice. This combo includes attractive Rakhi and 2 Temptation along with roli chawal. Raksha Bandhan is nothing without chocolates. 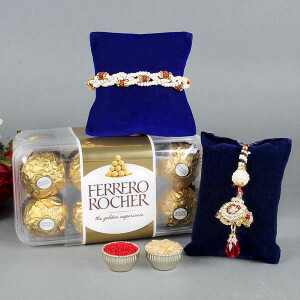 On this special occasion, astonish your darling Brother with this Gift Combo of a beautiful Rakhi and a Box of 16 pcs of Ferrero Rocher Chocolates. Raksha Bandhan is a significant Indian occasion celebrating the essence of the extraordinary relationship shared between siblings. Gift this charming pearl rakhi to your dearly loved brothers along with a Cadbury Celebrations pack. 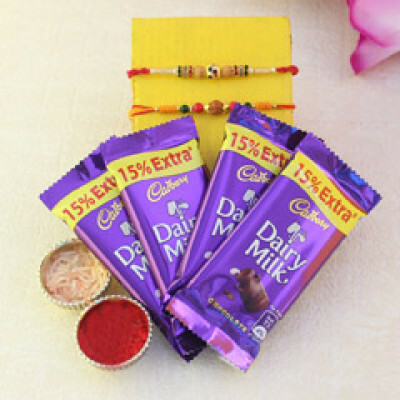 Obtain the fresh route on this Raksha Bandhan and astonish your loving Brother with a pack of Cadbury's Rich Dry Fruits and two beautiful Rakhis. Compose this day the most unique for your brother. Surprise your sweetheart brother this Raksha Bandhan with this striking Rakhi gift which your adored brother will surely love. The stunning Rakhi gift consists of Cadbury Celebrations (wt. 121.3 gms.) Box and Rakhi with Roli Chawal. Astonish your dearest brother this Raksha Bandhan with this astonishing Rakhi gift which they will surely adore. The Rakhi combo consists of Big Cadbury Celebration and Rakhi with Roli Chawal. - A Cadbury Celebration and Rakhi with Roli and Chawal. No one can defend against the enticement of devouring a luscious and appetizing chocolate. Thus, treat your brother to this delicious chocolate combo that contains 4 Rakhi with 4 Dairymilk of 12.5gm. Bring alive all your precious moments of togetherness with your brother on this Rakshabandhan. Thus, strengthen the bond of love with this attractive combo Rakhi with Roli Chawal and 4pc KitKat. Raksha Bandhan is a sacred occasion that makes the brother-sister relationship more strong. 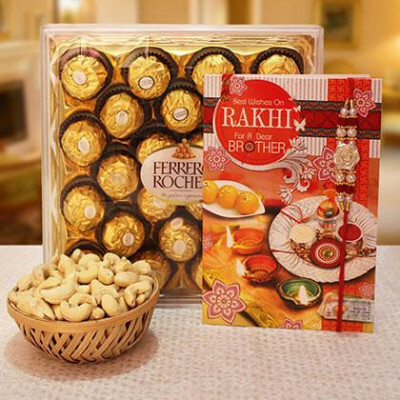 This Raksha Bandhan, send your wishes with this special combo that contains 4 Rakhi with 24pc Ferrero Rocher. The memorable occasion of Raksha Bandhan celebrates the exceptional bond of love and care between brothers and sisters. Thus, cement this bond with this beautiful combo that consists of 2 Rakhi with Roli Chawal and 4 Dairymilk of 12.5gm. Sisters always memorize about the lovely gifts which they get from their brothers. So accordingly they should plan a bombarding celebration to impress their brother on this Rakhi occasion with the top-notch gift hamper that consists of 12 Red Roses Bunch, 112 gm Cadbury Celebration and 1 Rakhi. Seasons appear and go with no hampering us but the season of Rakhi is the one which leaves its endless feeling on us. Thus, pamper your brother on this beautiful occasion with this stunning combo 1 Rakhi with 250 gm Kaju Katli, 2 Dairy milk Silk n 1 Greeting Card. Adopt this heart touching gift on this Raksha Bandhan that will make your brother feels superior and delight him with pleasure. Single rakhi represents a exclusive monarchs and reflects the deeper feelings hidden in it. The combo consists of 2 Rakhi, 300 gm Dryfruit and 16pc Ferrero Rocher. Every festival seems unexciting with no sweets and gifts, so this Rakshabandhan, gift your brother a box of chocolates, a bamboo plant and a beautiful rakhi made of rudraksha. This is the ideal arrangement to offer to your brother on this festive season! 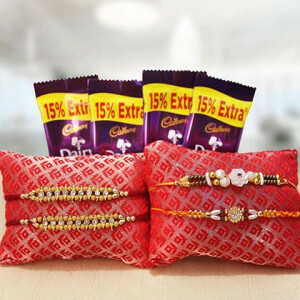 This Raksha Bandhan makes the sacred bond of protection, love, and care between brother and sister stronger by sending this astonishing rakhi combo that consists of Rakhi, Cadbury Celebration, and fresh Dry Fruits. This Raksha Bandhan reaffirms your adore and prays for the elongated life and achievement for your brother. 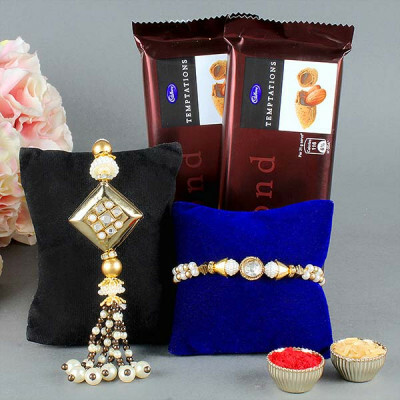 This rakhi gift hamper is the high quality, meaningful keepsake artworks, especially for this charming occasion. This combo includes one Rakhi along with roli chawal, Teddy, Chocolate Cake, a bunch of red Flowers, and 2 Dairymilk Chocolates. The sweetness of raisins and KitKat adds an alluring effect on the relations between brothers and sisters. To make this occasion memorable with this beautiful gift hamper for your beloved brother. The combo is the beautiful combination of 2 KitKat chocolates, raisins, and 2 beautiful rakhis along with roli chawal. Raksha Bandhan is a fantastic occasion to articulate love and care towards your brother in the finest way. Order this dazzling rakhi combo and let him know that how much you adore and be concerned for him. This combo consists of Rakhi, a cute teddy bear, a bunch of roses, and 2 Dairymilk chocolates along with roli chawal. An endless relationship seen in this 21st century is the bond between a brother and a sister. This attractive combo comprises of alluring Raksha Bandhan stuff to make your celebration memorable. 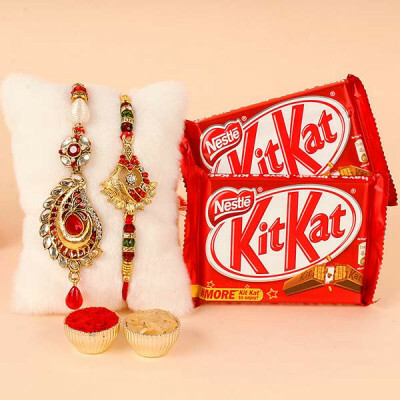 The combo consists of two Rakhis, mouth-watering KitKat chocolates, almond, roli, and chawal. Raksha Bandhan is an ideal time to articulate your emotions that how much you adore your brother. 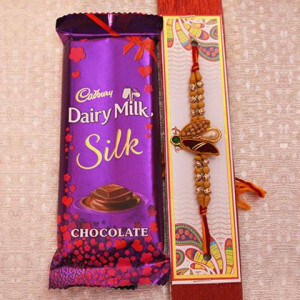 Wish him lots of achievement and affluence by sending this rakhi combo that consists of rakhi, orchids & dairy milk silk and makes him feel special. Rakhi is a unique sacred thread that weaves souls in a relationship of paradise everlastingly. Wish your brother a long life with lots of happiness and joys forever by sending a beautiful Rakhi combo of Pink roses, rakhi along with roli chawal, and Ferrero Rocher. This Musky twist that contains mix roses, teddy, Ferrero Rocher, and rakhi is sure to add a twist to your rakhi celebration. It's an incredible rakhi gift hamper which will astonish your brother and make him feel blissful. Rejoice the essence of siblinghood by sending this incredible rakhi gift to your brother. This astonishing rakhi gift consists of a Cadbury Celebration box, a gorgeous bunch of mix roses, a cute teddy bear, and a sacred Rakhi along with roli chawal. Raksha Bandhan is a favorable occasion celebrated with a lot of faiths and also strengthens the relationship of love between brother and sister. This rakhi celebrates the awesome feeling with your dearest brother with this special rakhi combo that contains Mix dry fruit, 500gm Soan papdi, dairy milk silk, and rakhi with roli chawal. Rakhsha Bandhan is a blessed festival which has a thoughtful worth in brother-sister relation. This amazing combination of the 6 mix roses in white paper packing, 1 Cadbury celebration, and rakhi is best suited for this lovely occasion.